The fall out from America's Ryder Cup shambles continues at pace while in the blue corner, the camaraderie of Thomas Bjorn's Europe is self evident. As Europe toast a 17.5 to 10.5 victory over their American counterparts, stories of bust ups are emerging. Patrick Reed claimed Jordan Spieth "did not want to play with him" and now details have emerged of a furious bust up between pals Dustin Johnson and Brooks Koepka with the two reportedly having to be separated in a "nasty" incident. 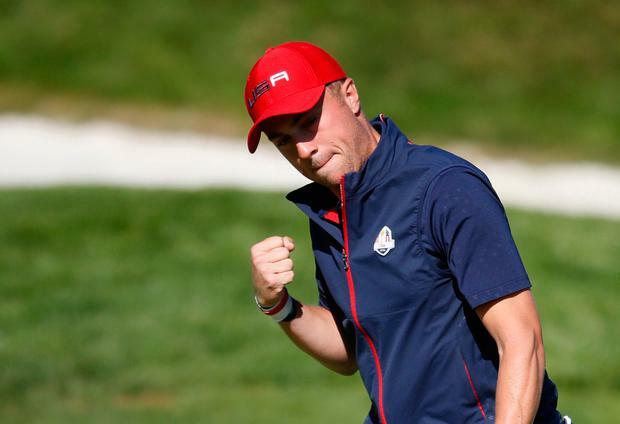 As if Europe did not have enough in their locker already, Sergio Garcia has revealed how American golden boy Justin Thomas inadvertently played a part in motivating Europe. It was revealed that an American T-shirt bearing the slogan "Beat Europe" was one of the main motivating tools for the Europe team. They set up a WhatsApp group and the image was the banner picture. Sergio García said: "There was a fair bit spoken about the picture in the team room when we saw it, and we decided to post it on our private WhatsApp page as a permanent reminder. "It was definitely an extra motivation, so what else can I say?"